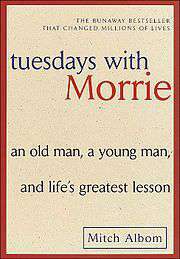 Anybody ever read the book “Tuesdays with Morrie”, written by Mitch Albomha in 1997 that topped the New York Times Non-Fiction Bestsellers of 2000? Yeah, what’s wrong with being number two? Tell me. Henrilyn Balgos and Patrick Gerald Ong like this. Lyn Danao read this already in 2003, touching. April Espinola That book remains to be one of my all time favorite. Love each other or perish.